All forms of telecommunications, including radio, telephone and television use multiplexing to send and receive information. Frequency division multiplexing (FDM), time division multiplexing (TDM), and wavelength division multiplexing (WDM) are all an extremely important asset to telecommunication processes and have greatly improved the way that we transmit and receive independent signals over AM and FM radio, telephone lines, and optical fibers. Multiplexing was first designed as a means to send multiple data streams simultaneously, through one transmission line. An integrated circuit reads and analyses each individual signal/data stream that’s being input into the multiplexer (also known as MUX) and then assigns it with a fixed-length time slot. Once assigned, the multiplexer now has what is called a single composite signal which it then transmits as a piece of data via the high-speed transmission line. The receiver then recovers the separate signals, and reanalyses it through a process called demultiplexing (or DEMUXing). On the other end of the high-speed transmission line, the composite signal is reanalysed and separated by a demultiplexer, or DEMUX. Frequency Division Multiplexing (FDM) is primarily used with analogue signals rather than digital data streams. It works by dividing the entire bandwidth which is available in a data source, into sub-channels that each have a different frequency; hence the name ‘frequency division’. Each sub-channel then carries separate signals through a transmission line or an aggregated channel (a combination of channels with higher bandwidth). The sub-channels can travel independently through a transmission line or they can travel simultaneously besides one another. These two travelling types represent two types of transmissions that we use every day. When you listen to your radio, either through amplitude modulation (AM) or frequency modulation (FM), the multiplexer generates a single station that you can tune into. We are able to decide to listen to just one station because each individual data stream that is being transmitted is regulated by a provider. If this wasn’t happening, we would hear unwanted static interference as the signals would overlap. This is very much the same with television broadcasting, and the same process allows us to separate the data in to channels. FDM is normally transmitted through coaxial cable, optical fiber or using a radio transmitter. Time Division Multiplexing (TDM) differs from FDM, as it uses alternating patterns of transmission through the single data signal. It is the method of combining more than one independent data stream into a single data signal and transmitting that single data signal through a multiplexer to a demultiplexer. It is also primarily used for digital transmission it may also be applied in analogue multiplexing. While TDM manipulates digital data, telephone circuits produce analogue data signals. In order for the multiplexing to work correctly, a codec decoder device is needed in order to process the analogue data. The codec decoder converts the analogue format to a quantized, discrete time format. Once the codec has converted analogue data to digital, the data is then multiplexed together using TDM. Once the data passes through the single transmission line, a demultiplexer is needed to take that single data signal and send it among many devices. Time Division Multiplexing is used commonly in closed-fixed communication networks such as the PSTN (Public Switched Telephone Network). Since its initial inception it has been developed much further, and now it is able to divide a networks bandwidth in to smaller and smaller parts. This allows providers to decide how much bandwidth to allocate to certain devices. Wavelength Division Multiplexing (WDM) uses fiber optic cables to transmit a large number of data streams, which is favoured over the conventional use of FDM and TDM systems. 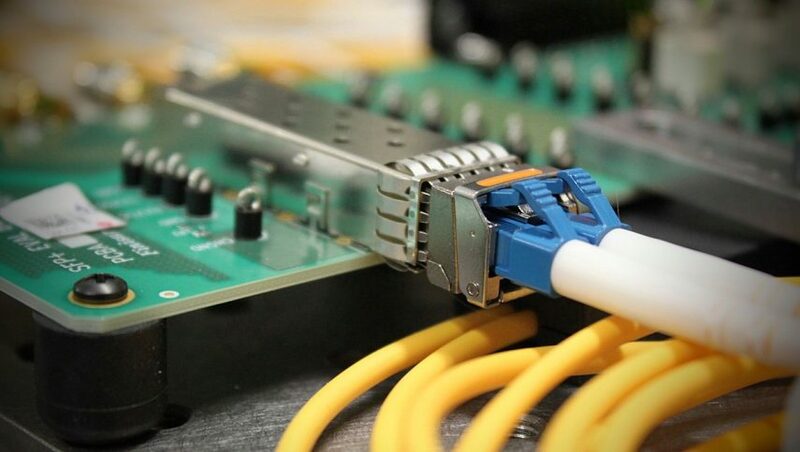 The capacity of data streams that can be sent via fiber cables has meant that WDM has become a very popular technique for modern telecommunication companies. Transmitting through WDM is possible because the method combines numerous data signals on laser beams at different infrared wavelengths along transmission lines. It is very similar to the FDM technique described earlier in the article, however it operates at the infrared end of the spectrum. It starts by using a laser which is controlled by a single set of data signals and at the receiving and of the system there are infrared-sensitive filters that direct each signal to its destination. At the multiplexer, each data stream being passed through the fiber cable has a different level of energy, translating to a different infrared wavelength. Once combined at the multiplexer through a prism, it is transmitted through a shared fiber optic cable and they are split again with another prism at the demultiplexer. At Carritech, we specialise in prolonging the life of telecommunications networks with the timely supply, repair and refurbishment of many types of equipment. Many of which utilise FDM, TDM and WDM technologies for data transfer. To find out more about individual uses of FDM, TDM and WDM including the products that use them, click here.